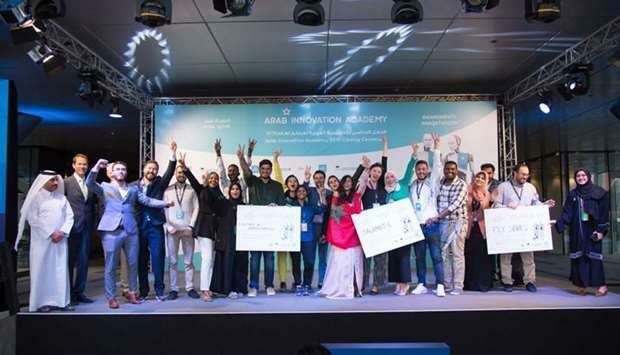 The startup ideas produced by the participating teams addressed many global problems from retaining children's interest in reading and re-utilising industrial wastes, to simplifying the search for blood donors and spanned several industries, including health, education, construction, real estate, and tourism. The AIA 2019 first place winner was team ‘Salamat-e', which developed a mobile app that serves as a ‘health passport'. The app is connected to GPS, and contains information about epidemic diseases in the region of a particular travel destination, as well as prevention methods and necessary vaccinations. The second-place award went to team ‘Fly Stories', which created a platform that provides children with an interactive reading experience, and authors with an outlet to publish their stories. Members of the team include Aboubakr Aqle, Ghadeer Abuoda, and Omer Abad from Hamad Bin Khalifa University, a member of Qatar Foundation, Qatar; Jalila Rashid Al Sharqi from Sultan Qaboos University, Oman; and Tasneem Ismail from Doha Institute for Graduate Studies, Qatar. Teams ‘EyeTalk' and ‘WheelsOnClick' were tied in third place. ‘EyeTalk' presented a concept of a software-hardware system that can help people with disabilities communicate using just their eyes, by blinking. Team members include Abdelkader Keddar and Samia Cherifi from the University of Abou Bakr Belkaïd, Algeria; Abdullah Abdulwakil and Do?ukan Aksu from Istanbul University, Turkey; and Shaikha Alsubaey from Qatar University, Qatar. ‘WheelsOnClick' created a platform that connects owners of underutilised cars with people in need of cars for a short period. The platform follows the popular Airbnb concept, which users can use to look for, or list cars, for rent. Members of the team include Abhimanyu Saini from Indian Institute of Science, India; Fathalrhman Adam from Al Neelain University, Sudan; Garima Natani from Indian Institute of Technology, India; Omaiyma Hilal Alkathiri from Ibri College of Technology, Oman; and Wisal Ahmed Khatir Bakhat from Alzaiem Alazhari University, Sudan. Yosouf Abdulrahman Saleh, executive director of QSTP, said: 'I'm very proud of what we've achieved in the second edition of AIA, with the majority of the teams completing their projects throughout their journey with us. We look forward to educating the public and raising further awareness about the substantial benefits of the AIA programme, while encouraging greater participation from the youth of Qatar and the region in our third edition." Alar Kolk, president of EIA, added: 'This year, we have welcomed a record number of participants from all corners of the Mena region. Here, students develop the skills and confidence needed to develop startups from scratch, and learn to create unique value in the world of entrepreneurship and innovation.